The Artist turns planning into a work of art. Every page of this person’s bullet journal is a little piece of art in and of itself, from decorative borders and beautifully hand lettered daily headings to entire spreads. Think of The Artist as somebody who uses their bullet journal as a sketchbook—to plan and to push themselves as an artist, all in one place. Image by @minte.studio on Instagram, a beautiful account full of bullet journal inspiration—go give them some love! Image by @wolkenmeere on Instagram, an account great for artistic and classy bullet journal inspiration—go give them some love! Each finished page can make you feel accomplished—you’ve planned and organized your life, and it looks beautiful too! Bullet journaling this way can make sure that you’re creating art every single day. This is a great way to stretch yourself as an artist! Each new spread can be a new challenge, your own creative ‘prompt.’ You can challenge yourself to create a whole new style every week. Or you can create themed months. For instance, if you want to get better at drawing tropical plants, you can challenge yourself to create one every day for the month of March. Or as a calligrapher or hand letterer, you can create a new style of calligraphy every month and practice it every day (I have a blog post about how to get started doing this, too!). This way, at the end of the year you have twelve of your very own new styles to work with, all of which you are very skilled at! Image by @overalergens on Instagram, an account great for varied artistic bullet journal inspiration—go give them some love! Setup time can be extensive, which may prevent The Artist from planning at all on busy weeks. Feels pressured to make each page beautiful, so when creativity is lacking, Artists may feel too daunted to start drawing or planning. This goes hand-in-hand with “fear of the blank page,” and feeling paralyzed by the prospect of making a mistake that will ruin a spread. 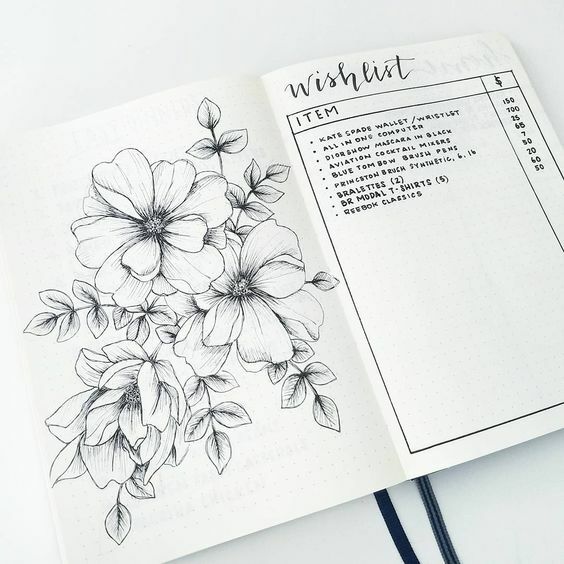 Image by @feebujo on Instagram, one of my very favorite accounts for bullet journal inspiration—go give them some love! Create room for daily creation, and don’t get in a rut—try new things! At the beginning of the year (or every 6 months), plan new ways to utilize your bullet journal to its greatest potential for both planning and stretching yourself as an artist! I just love the subdued but beautiful pastel colors of Zebra Mildliners. Integrate your intentional practice into your task list. This way, you make sure it gets done, and you get to feel accomplished twice—by looking at what you created, and by checking it off your list! Faber-Castelle Gelatos and watercolor pencils are fantastic ways to add touches of watercolor to your bullet journal without having to use a dedicated mixed media sketchbook. Arm yourself with pretty labels and stickers (or even basic acrylic paints) that will cover up mistakes, even full-page labels if a mistake takes a particularly bad turn. That way, you can push forward with abandon, knowing that no mistake is unfixable! Avoid burnout! Stick with it, even if it means getting into a routine and only trying something new every once in awhile. Give yourself freedom to have some plainer spreads, so that you can work on those “masterpiece” spreads over several days. One artist created a spread with a giant circle and added to it every day of the week, with the intention of having a completed drawing by the end of the week (unfortunately, I can’t find the source of this image for attribution, so I won’t display it). Some slowly complete a zentangle or a whole-page design. Some add boxes into their layouts for future pictures. Try learning hand lettering! A great (and free) place to start is my printable eBook and workbook, Simple Script. Image by @bonjournal_ on Instagram, an account great for bullet journal inspiration and a beautiful artist—go give them some love! Are you an Artist? Got any tips to add? Tell me below in the comments! I’d love to hear from you.